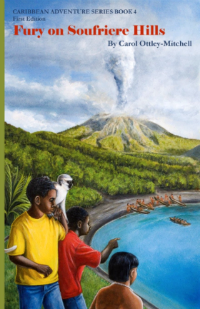 Carol Mitchell-Ottley talks to Summer Edward about her latest middle grade novel, Fury on Soufriere Hills, being nominated for the 2014 Astrid Lindgren Memorial Award, and more. Born in Nevis, Carol Ottley-Mitchell loves books and kids. She has lived in and traveled to many Caribbean countries. 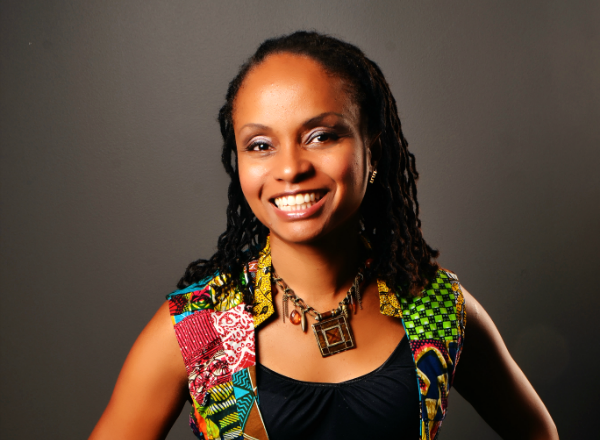 She is the author of the Caribbean Adventure Series books, the Chee Chee picturebook series, as well as the picturebook Seascapes, and the YA book, Another Day. Shortly after learning of her Astrid Lindgren Memorial Award nomination, Ottley-Mitchell spoke to Summer Edward about her approach to writing, the business of publishing, and the life of a children's author. S. E.: Let’s talk about your latest book. Fury on Soufriere Hills is Book 4 in the Caribbean Adventure Series. What is it about? C. M-O. : Fury on Soufriere Hills, or Fury as we affectionately call it, is about volcanoes, adventure, and Amerindians. Mark and Kyle, two characters that feature in earlier books in the Caribbean Adventure Series, hike with a group to the top of Mount Liamiagua in St. Kitts. Frankie, a defiant younger boy, is along for the hike. When Mark attempts to rescue Frankie from the edge of Mount Liamiagua’s crater, they both tumble over the edge. They find themselves in very unfamiliar territory and soon realise that they have not only traveled into the past, as evidenced by the appearance of a Carib boy, but they have for the first time traveled in space, from St. Kitts to the foot of the Soufriere Hills volcano in Montserrat. The Carib boy saves their lives and in return, with Chee Chee’s help, they are able to assist the Caribs when the volcano threatens to erupt. S.E. : The 1996 eruption of the Soufriere volcano is one of those watershed moments in recent Caribbean history, certainly in the history of Caribbean natural disasters. How does one tackle the reality of natural disasters in a work of children’s fiction? It certainly is a pertinent issue in today’s world isn’t it? C. M-O. : Natural disasters and the possible impact of global warming are certainly topical issues and Fury tackles the very relevant issue of a child who is displaced by a natural disaster. My intention in the Caribbean Adventure Series is first and foremost to draw young readers in with secret tunnels, pirate ships, kidnappers, and erupting volcanoes galore. As a result, I introduce serious issues in the lightest manner possible without being trite. For example, the first book in the series, Adventure at Brimstone Hill is set in the Caribbean in the 17th century and so it is impossible to ignore the reality of slavery, however, it is not the center of the story and so I touch on it very briefly. Similarly in Fury, although one of the characters is angry about being displaced by the volcanic eruptions, unlike many real-life refugees, he is living in a safe environment and in the end … well, I’ll let you read the book to see how it all turns out. S.E. : The Caribbean Adventure Series is a time-travel/historical fiction/adventure series of children’s novels set in various Caribbean islands. In the world of fiction, it’s something that’s rarely ever been done. You’re reimagining aspects of Caribbean history that are simultaneously over-stereotyped and underexamined―pirates, the physical landscape, and in Fury on Soufriere Hills, the indigenous Amerindians, and you’re doing it for a children’s audience. Do you ever feel like you’re farming in an empty plot? I guess I want to know what it takes to build up these kinds of stories from scratch? C. M-O. : To be honest, I never thought of the series as being ground-breaking, but perhaps in the Caribbean context it is. I am very happy to be filling a niche that may be needed, awakening an interest in Caribbean history by placing modern day children into past scenarios. To a large extent the stories build themselves. The initial spark might be something that I see or read and then the rest of the ideas come as I write. Often the original ideas are discarded and replaced with more feasible ones. Sometimes I am stuck for long periods. In Fury, the children in the book sat in the shadow of the volcano eruption in Montserrat for months as I tried out different scenarios for escape. I don’t necessarily recommend this approach to writing, but it is what works for me. S.E. : The Caribbean Adventure Series is your most recognizable work, but you’ve also authored the Chee Chee’s Adventure Series, which is a picturebook series, and another picturebook, Seascapes. Do you thrive more writing novels or picturebooks and why? C. M-O. : If I had to choose, I would have to say that I am a short story writer at heart. There is something satisfying about putting a complete idea across in one sitting. As I write this I can picture the satisfied looks on children’s faces after hearing the ‘happily ever after’ ending of a story. However, I also enjoy the scope for depth and revelation that the novel affords and Caribbean children novels are what I think is necessary to fulfill my desire to encourage Caribbean children of all ages to read. I have already written two more short stories to finish up the Chee Chee’s Adventure Series, and I have been commissioned to do some short stories on a particular topic. My plan is, however, to focus on novels going forward. S.E. : This August you self-published your first young adult novel, Another Day, a book about a fifteen-year-old teen who struggles to find her place in a new environment. What inspired your crossover from children’s literature to young adult fiction? And while we’re talking YA, what do you make of the Caribbean YA market today? C. M-O. : I started Another Day several years ago while I was living in Ghana. I was working on one of the Caribbean Adventure Series books when the story popped into my head of a girl going through a difficult time after moving to a new country and communicating via messenger with the best friend that she left behind. At the time I thought it was a short story so I started writing it, but it began to morph into something more and I had to put it aside while I completed the work that I had in process. While I was battling with the ending for Fury, I came across the story in my notebook and decided to make it my next project. So the reality is that I did not make a conscious decision to write a young adult novel. The story that I started in Ghana was about a teenager who was having experiences involving alcohol, drugs, and romance and so one could say that it announced itself as a young adult novel. Once I decided to complete Another Day, I read a lot of novels with teenaged protagonists to help me to prepare, however, I must admit that none of them were by Caribbean authors or even Caribbean themed. I am really familiar with very few YA novels by Caribbean authors, and my impression is that we really need many more Caribbean books for this age group. I’ve read a couple of books that are labelled as young adult because the main protagonists are teens, however, I find that they are so explicitly focused on the sexual aspect of the coming of age experience that I would recommend only to the oldest tranche of the YA group. S.E. : You are well known for your writing, but you’re also a publisher. Give us an overview of your publishing house, CaribbeanReads. CaribbeanReads is a small publishing company dedicated to serving talented Caribbean authors. Our aim is to make publishing more accessible to potential Caribbean authors and to increase the number of high-quality books about and for the Caribbean. Basically CaribbeanReads offers all of the services necessary to get the book from a draft into a finished product, for example, editing, type-setting, layout, and illustration. We do not provide any major marketing effort. Things have been moving slowly but we are working with a couple of authors. S.E. : Most children’s authors will tell you that they aren’t in this field for the money. What has the commercial side of being a children’s author taught you? C. M-O. : Relatively few children’s authors make it big enough to make a comfortable living on writing alone and I do believe that most of us are driven by a passion for words and expression. 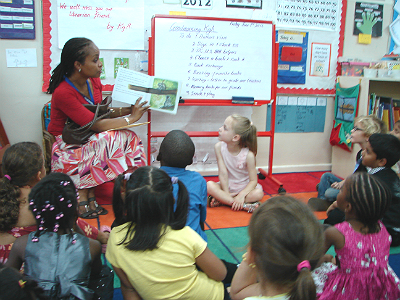 Children’s authors in the Caribbean are perhaps at an even greater disadvantage because of a number of issues including lack of resources, the small market size and problems distributing books across geographically diverse markets. I honestly write because I have to and I am driven forward by the thought that my work may encourage even one child to read. I recently received an email from a colleague who told me that her nephew was in the hospital for a few days and in that time, without the distraction of the TV and other electronics, he picked up the second book in the Caribbean Adventure Series, Pirates at Port Royal. He read it and regaled her with details about the story all the way home from the hospital. This is what keeps me going. I think that it is very important, however, that parents begin to encourage and support Caribbean children’s authors by insisting that the education system incorporate a wider range of quality Caribbean children’s literature into the curriculum. S.E. : You were nominated for the 2014 international Astrid Lindgren Memorial award. It’s the world’s largest children’s literature award and only a few Caribbean children’s authors have ever been nominated. 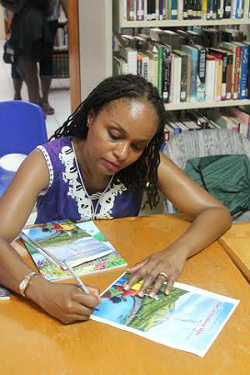 Do you think this nomination signals a new era for Caribbean children’s literature? C. M-O. : I certainly hope that my nomination will shine a spot light on Caribbean children’s literature and encourage more nominating bodies to actively seek out and submit our work. S.E. : You have two children, you travel, you run a publishing house, and yet you somehow find time to write. From one writer to another, please tell me how you do it! C. M-O. : Very little sleep and lots of caffeine. Just kidding. I’m not sure that I’m a good model. When I look at how many books Enid Blyton churned out, or the number of books in the Magic Tree House series, I feel like a real slacker with only nine books under my belt. But seriously, the basic principal is consistency. Carve out a couple hours out of your day that you dedicate to writing and stick with it as much as possible. For me, this is at night after the children have gone to bed at which point I try to dedicate two hours to writing. Sometimes this plan works better than others, but even when I don’t get it done for a while, I get back on track whenever I can. In addition, I’m always turning over my work-in-process in my head, scribbling notes on a scene while I’m cooking or recording ideas (handsfree) on my phone while I’m driving. S.E. : You’ve collaborated with UK illustrator Ann-Catherine Loo on the Caribbean Adventures Series books. Her artistic style― realistic pencil illustrations― embraces literal representation. Historically, Caribbean children’s book illustration has favored cartoon, folk, or impressionistic styles, so the illustrative realism of the CAS books seems like a notable illustrative shift in Caribbean children’s literature. Is this something you actively thought about in your choice of an illustrator? What might illustrative realism contribute to Caribbean children’s literature in general? C. M-O. : I came across Ann-Catherine when I was just starting out and we have had a wonderful partnership over the years. I was looking for someone who could deliver in a short time frame and with whom I could maintain a very professional relationship. Illustrative realism—I did not have a term for it then, but I knew it when I saw it—was my top priority in choosing an illustrator. I believe that Caribbean children really need to see themselves portrayed in books the way they see themselves in the mirror. I wanted children to pick up my books because they were drawn to the images on the front cover. The look of a book is of paramount importance in encouraging a child to read, and too often we don’t pay enough attention to cover design as a medium for drawing children (and parents) towards our books. So, I reviewed the work of several artists, especially looking at the way that they portrayed people of colour before settling on Ann-Catherine. I was also very upfront with her about why I chose her and what I wanted from the illustrations. Since the Caribbean Adventure Series I have worked with two Caribbean illustrators, Vanessa Soodeen who illustrated Seascapes and Cherise Ward who illustrated Another Day. These ladies reaffirmed my belief in Caribbean illustrators. Both women were extremely professional, handled my indecision with great patience, and produced exceptional work. I intend to continue to use Ann-Catherine for future publications for the Caribbean Adventure Series and the Chee Chee’s Adventures, however, I hope to continue to discover Caribbean artists in subsequent publications. S.E. : I’ve heard the complaint that too many successful Caribbean children’s writers live abroad. You were born in Nevis and spent most of your adult life between the Caribbean, the US and Ghana. Travel seems to be a way of life for you. Is there a case to be made for travelling and migration in terms of the writing life? Also, I’m curious, why Ghana? C. M-O. : The number of successful Caribbean writer’s living abroad begs the question: are they successful because they have moved abroad or does the experience of living abroad improve their writing thus making them successful? The answer is probably a little bit of both. It is difficult to become a successful author in the Caribbean. The publishing houses are few and tend to focus on academic publications. Many publishers in the US and the UK focus on books produced by their nationals. As a result, migration is often a key ingredient for successful authors. In addition, the Bible’s pronouncement that “A prophet is not without honor, except in his own hometown …” is too often proven true in the Caribbean context. We tend to wait for our artists to receive foreign accolades before we recognize them at home. On the other hand, while I don’t think that foreign experience is a necessary ingredient in a writer, I will say that experiencing other cultures helps you to better describe your own because you can identify, appreciate, and thus portray the idiosyncrasies more clearly. S.E. : The life of an author is interesting, even more so the life of a children’s author. Children’s authors always tell the best stories about their work, especially their encounters with children. What’s one thing that a child reader did or said that you will never forget? C. M-O. : Do I have to choose just one? One of the best parts of my job as a children’s writer is doing school visits. I relish the interactions with the children and the fresh perspectives that they express. One of my more heartening experiences was when I did a book launch/writing workshop in Ghana. I invited a number of children, mainly expatriates, but there was a road block on the main thoroughfare to get to the venue and so many people were unable to attend. It turned out that there was a reading programme finishing up at the venue just as we were getting ready to start. It had been attended by disadvantaged children in the neighbourhood who had difficulty reading. I invited those children to join in the workshop. At first their participation was tentative but by the end they were raising their hands and thoroughly enjoying the activities. It was wonderful because their life experiences brought a new perspective into the discussions. I sincerely believe that the event resonated longer with those children than most of the original invitees for whom access to books and education was never an issue.